Sideshock was Mars' top military genius. When A.F.M. High Command gave him the job to conquer Earth, Sideshock reveled in joy at the opportunity. Unfortunatly for him, he was given a bumbling scientist named Mask as his second in command. With an army of A.F.M. alien guards and a genius scientist/weapon inventor on his side, the Earth would be an easy conquest. It turned out, however, that it wasn't. 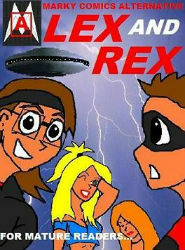 Two superheroes name Lex Morgan and Rex Davidson stopped the A.F.M. invasion with a combination of dumb luck and the ineptitude of Sideshock and his team. Sideshock was in awe at the great weapons Mask created. But soon that awe turned to frustration. Although the weapons did work they often backfired on Sideshock and Mask. Enhanced intelligence: Sideshock's mind for planning an assault on Earth is genius high level. What he lacked in combat and brute force he gained in wisdom and strategy. His plans of attack are so impressive that even A.F.M. High Command took notice and promoted him to lead the A.F.M. invasion of Earth. Weaknesses: What Sideshock has in his genius mind of attack is often followed up by defeat. He plans a good show, but following through with said show is another matter. Often defeated by his own means of Mask's malfunctioning weapons or his lack of physic combat techniques (he has been punched out by both John and Cammi). Lex and Rex continue to be a thorn in the A.F.M. side. Paraphernalia: Sideshock wears a strange looking helmet that has strands of hair sticking out from the top and sides and shows his true facial emotions One can almost say, his helmet is his face. Adorned in golden torso armor and a red cape, Sideshock shows why he is elite in the A.F.M. attempt to conquer Earth. If only his elite plans work out..